Windows 8‘s Metro interface may be controversial, but it looks like few PC users will complain about the new operating system’s performance. The PCWorld Labs put the Consumer Preview of Windows 8 through a battery of tests and found it generally faster--sometimes a lot faster--than Windows 7. 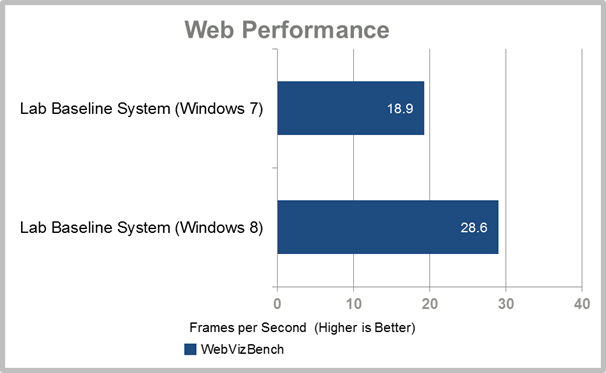 Our test system running Windows 8 Consumer Preview started up faster, ran through our WorldBench 7 benchmark faster, and showed superior performance when browsing the Web, compared with the same system running Windows 7. In only one major test, our office productivity measure, did Windows 8 lag behind Windows 7 performance. Obviously, these results are far from definitive, since they’re based on a preview rather than on the final version of the new operating system. But once Windows 8 is finally released, it is entirely possible that the performance will improve, since we had to use drivers that weren’t yet tweaked for Windows 8. The results also jibe with what readers who had installed the Consumer Preview told us in a recent survey. About 40 percent of respondents said their machines seemed faster with Windows 8, and only 9.4 percent said they seemed slower; nearly 45 percent noticed no significant change. We tested using our WorldBench 7 tests, performed on the Labs' baseline system, which is built around a 3.3GHz Intel Core i5-2500K processor. That CPU is coupled with 8GB of DDR3 RAM clocked at 1333MHz, a 1TB 7200-rpm hard drive, and an Nvidia GeForce GTX 560 Ti graphics card. Our testbed system is certainly no slouch, but it represents what we’d call a middle-of-the-road PC. We loaded the Consumer Preview of Windows 8 on the system, and compared our results with the numbers we already had for the same system running Windows 7. Windows 8 ran through WorldBench 7, our comprehensive performance benchmark, 14 percent faster than Windows 7. Generally, any difference of 5 percent or more on WorldBench is noticeable, so this is a difference you should feel when you’re running a Win 8 machine. If you hate waiting for your PC to get going, you should like Windows 8. Our system started up at least 35 percent faster running Windows 8 than it did while running Windows 7. 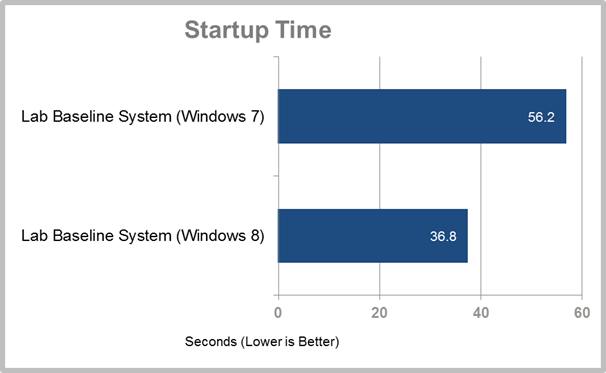 Under Windows 7, our average startup time was 56.2 seconds. Under Windows 8, that time dropped to 36.8 seconds. That number is even more impressive considering that Windows 8 has a built-in handicap. To measure startup time, we command Windows to open a text file in the PC’s startup folder, and time how long it takes from when we press the power button to when that text file opens. Because Windows 8 starts up in the Metro interface, not the traditional desktop, our testbed had to boot up, load the Metro interface, and then load the desktop to get to that text file. The average time to reach the Windows 8 Start screen (without getting to the desktop) was even faster: just 23.91 seconds. And that was on a spinning-platter hard drive--if you’ve upgraded to a solid-state drive, your startup time will be even quicker. Why is Windows 8 so quick to start up? With the latest incarnation of Windows, Microsoft has introduced a new “hybrid boot,” combining the speed and functionality of Windows’ hibernate mode and the benefits of a fresh startup session. A bit of background: When you choose to shut down your PC, Windows closes all running applications and services, and then powers down. When you choose the hibernate option, Windows writes everything currently in RAM to a file on your hard drive, and then shuts down. This adds some time to the shutdown process, but your PC will boot faster and be right where you left it before hibernating. In Windows 8, shutting down your PC closes all running applications, but hibernates the underlying operating system. When you turn your PC back on, Windows 8 will load that saved state much faster. The bottom line is that it's just like a clean boot in a fraction of the time. The Building Windows 8 blog details the architectural changes. The strides that Microsoft has made in hardware acceleration and browser optimization are evident here, with Windows 8 having a frames-per-second score that’s 50 percent better than the same system running Windows 7. 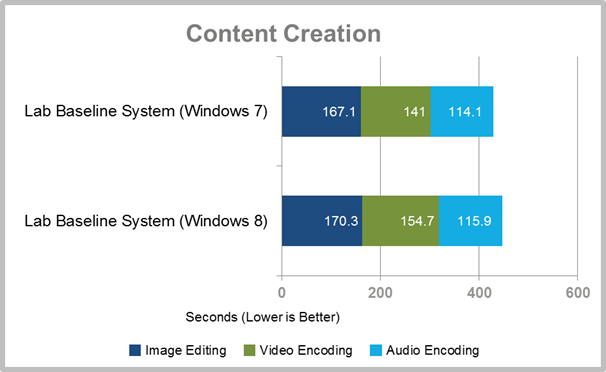 The differences aren’t as great in our Content Creation tests, which measure how well a machine performs in encoding audio and video, and in editing images. Our system running Windows 7 was a bit faster than the same system running Windows 8. Those differences were rarely greater than a few seconds, though, and the results could change dramatically once updated video drivers are introduced for Windows 8. 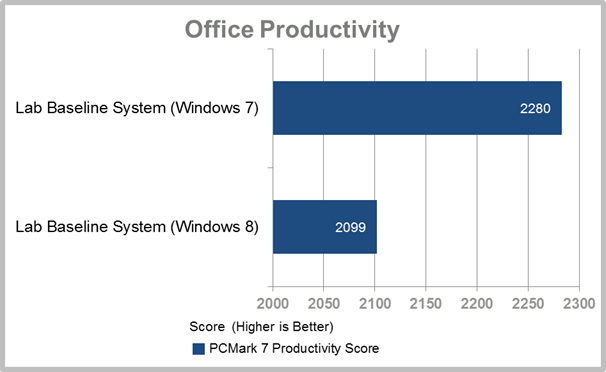 Windows 7 won decisively only in our Office Productivity test. Our test uses the Productivity section of Futuremark’s PCMark benchmark tool, which includes typical office tasks such as editing text, launching applications, and scanning for viruses. On this test, Windows 8 was roughly 8 percent slower than Windows 7. It’s worth noting that Futuremark is in the process of updating its benchmark suites for Windows 8, and those updates could change this result. These performance numbers will likely shift in the coming months as Microsoft releases updated versions of its new OS. The Windows development cycle will stretch for months, and will include driver updates, performance tweaks, and general optimizations that are bound to improve things. Windows 8’s dramatic new interface may not be a runaway hit with PCWorld readers, but the numbers don’t lie: Even in its early form, this is promising to be the leanest, most efficient incarnation of Windows to date.